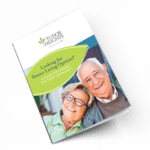 Your guide for finding the right assisted living community. The decision to move to an assisted living community can be a big one. For many — especially those who value a secure setting that provides opportunities for socialization and promotes a healthy, active lifestyle — the answer is a senior living community with a variety of lifestyle choices. To make the best decision to serve your needs, it’s important to understand the options available to you. Call 410-318-8000 or complete the form to receive your copy of Tudor Heights’ A Guide for Finding the Right Community.